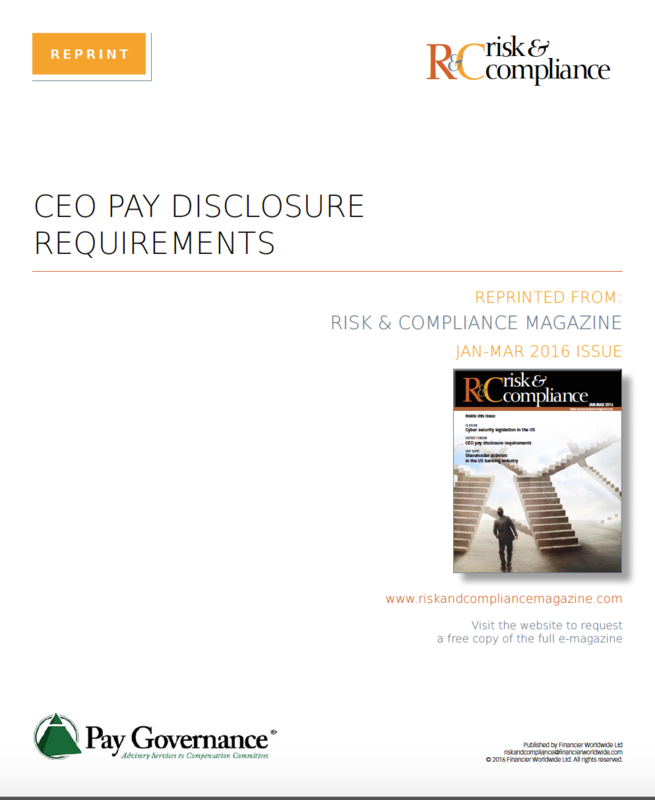 Pay Governance LLC has recently participated in a forum conducted by Risk & Compliance Magazine regarding proposed new rules regarding the disclosure of CEO pay as set forth by the Securities and Exchange Commission (SEC). Our consulting firm, along with three prominent law firms, have commented on several aspects of the controversial new proposed CEO Pay Ratio Disclosure rules as well as the proposed CEO Pay for Performance rules. Clearly, the CEO Pay Ratio Disclosure is a contentious issue, and Pay Governance LLC has expressed its concern as to whether the pay ratio disclosure is meaningful and reveals anything insightful about a company’s executive compensation program. The forum and the comments of our firm are included in the attached reprint from the January-March 2016 issue of Risk & Compliance Magazine. click here.